I have wanted to read this graphic novel duology for a while now and I finally had the chance to when one of my best friends mentioned she owned both volumes and was kind enough to lend them to me. I’m not going to lie, I was (and still am) a big My Chemical Romance fan and after finding out that Gerard Way was behind this series, I just knew I had to read it. Stay tuned for my review of volume two in the near future. Goodreads Synopsis: In an inexplicable worldwide event, forty-seven extraordinary children were spontaneously born to women who’d previously shown no signs of pregnancy. Millionaire inventor Reginald Hargreeves adopted seven of the children; when asked why, his only explanation was, “To save the world.” These seven children form the Umbrella Academy, a dysfunctional family of superheroes with bizarre powers. Their first adventure at the age of ten pits them against an erratic and deadly Eiffel Tower, piloted by the fearsome zombie-robot Gustave Eiffel. Nearly a decade later, the team disbands, but when Hargreeves unexpectedly dies, these disgruntled siblings reunite just in time to save the world once again. Many people had doubts about this story when it was first released solely because it is written and created by Gerard Way, the front man of the popular pop/rock band My Chemical Romance. On one hand, I can see why this may have made some people skeptical. 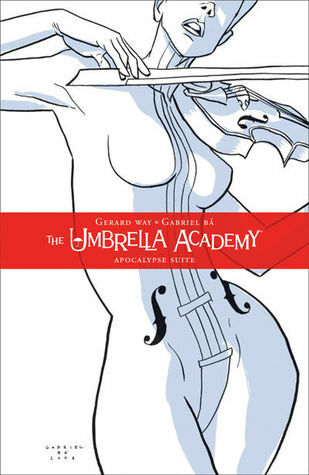 On the other, because I am a fan of My Chemical Romance and I am familiar with the work that Way has done with the band, I know that his creativity and artistic talent is fantastic which gave me full confidence in The Umbrella Academy. In terms of creativity, I think the idea of all of these different children being born to random women is very original and different. I would love for it to be explained a little more, but if the question never get’s answered I wouldn’t be completely disappointed. A little mystery never hurt anyone. The differentiation between all of the members of the Umbrella Academy team was really well done and I love their unique looks, personalities, code names and superpowers. My favourite of the Umbrella Academy children is definitely Kraken although it’s a close tie with Séance. What I found to be the most creative were the villains. I mean, the Eiffel Tower? That’s just fantastic. The storyline itself was hard to follow at times and I still find myself a little confused by some of the events that took place. I feel like there is still a lot that needs to be answered and I hope that there is a certain sense of closure in the second and final volume. I am always impressed with illustrations and those who are blessed with the amazing talent to not only draw, but to conceptualize new characters. I studied Graphic Design in university and we shared our space with the Illustration students and I was always insanely jealous of all the talent that surrounded me. I always feel like I repeat myself when I review the illustrations within a graphic novel because I just love everything about graphic novel art. What I loved about this particular bind up was that it included some of Gerard Way’s own initial sketches on his ideas before Gabirel Ba helped to bring the full story to life. Both of these guys are extremely talented. Overall, I was impressed with the originality of the story and the many different unique characters. My only criticism is that it was hard to follow at moments. I’m hoping for some explanations and closure from the second volume which I plan to read immediately. Stay tuned for that review and as always, thanks for reading!